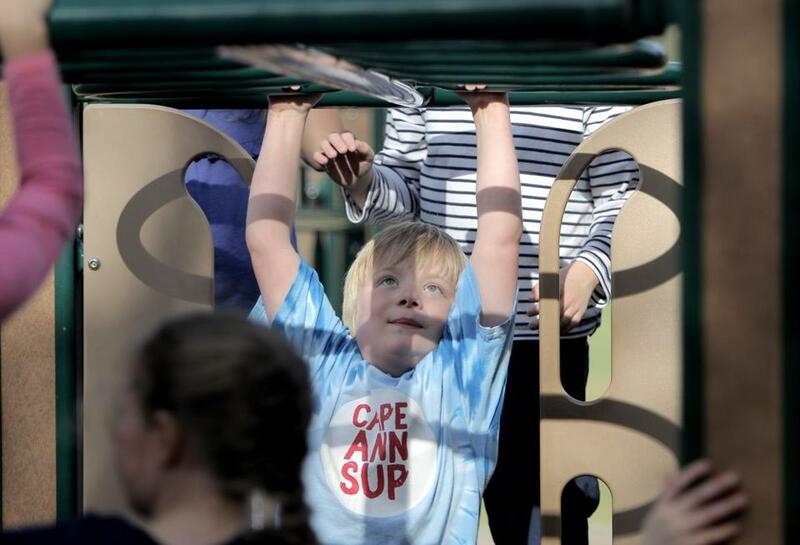 Leo Woolfenden played on the monkey bars during recess at the Bessie Buker Elementary School. 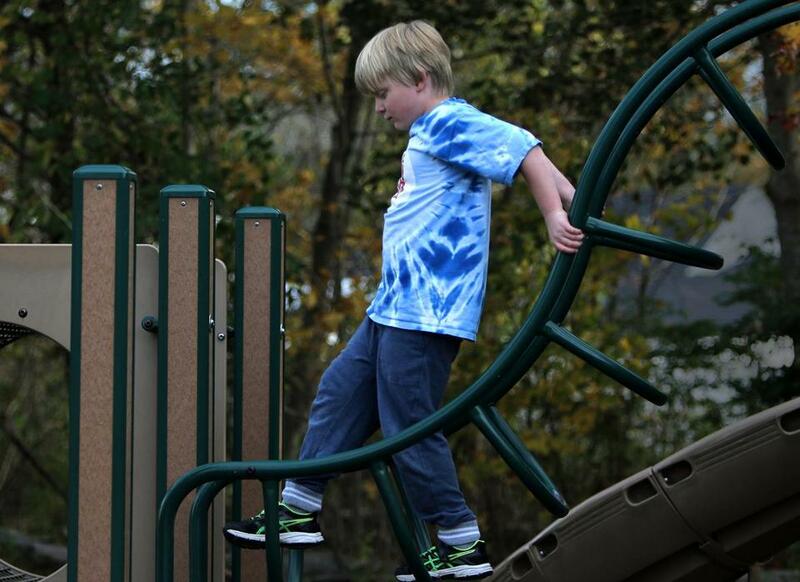 WENHAM — For most of first grade, Leo Woolfenden was afraid to try the monkey bars. He spent recess on the periphery of the playground, hanging back from the others with his friend Tom. If he went near the monkey bars at all, it was only to grab the first rung, hang for a corner of a second, and let himself fall without a fingernail of fight. He wasn’t much better in the first days of second grade, when a girl in his class watched him at recess, dangling and going nowhere. Amelia Lauredant is 7½ years old, with dark curly hair and zero front teeth, and she had an idea already worked out and arranged when she rushed up to Miss Kathy O’Shea to deliver the news. Leo was going to learn the monkey bars, and Amelia was going to be his coach. Amelia announced this news in her thrilled way and hustled Miss O’Shea back across the playground to bear witness. O’Shea was elated, for she knew things that Amelia didn’t about what happened to Leo at the Marathon. Leo called it “blast day.” His father had taken him in his stroller to see his mother run her first marathon. They were at the finish line when a bomb went off. His dad tried to wheel him away and then a second bomb went off. It fractured Leo’s skull and blew out an eardrum. His father’s leg was torn off. Steve Woolfenden had crawled to his son before being rushed away to Boston Medical Center and Leo to Children’s Hospital. Leo was alone there for hours before his mother, who had been stopped at mile 25, could finally get to him. A photo of Leo being carried away by a Boston police officer, his hair matted in blood, was on the cover of Time magazine. The first couple years of therapy did not go well. “He was so withdrawn in kindergarten that they worried he was on the spectrum,” his mother, Amber, said. Leo Wool-fenden, with cheering support from Amelia Lauredant, hung from a bar in Wenham. Leo had been hurt in the Marathon bombing. The family moved to Wenham and enrolled Leo in Bessie Buker Elementary School, which had a strong record of special services. There, the boy’s shell began to slowly open. He had grown now into a sweet boy of 8 with shaggy blond hair, the biggest kid in his class with a quiet sense of humor. But he remained unusually shy and often quit trying something new rather than risk failing. So as O’Shea watched Leo stretch his arm out for the first bar, with Amelia squealing what would become their mantra — “reach and regrip” — she felt her chest swell. Leo didn’t make it past the first rung that day. But every afternoon when recess came, Leo and Amelia hot-footed it the 75 steps down the hallway from O’Shea’s classroom to the big double doors that led to the playground. Sometimes, even when it wasn’t recess, O’Shea let them go out with an aide to practice on their own. The team picked up a cheerleader, a boy named Dillon Harper, and with Amelia coaching and Dillon cheering and Leo sticking out his tongue for extra power, he got to the second bar, and then the third. But there were six rungs on each side of the monkey bars. Some children, including Amelia, made it look easy, gliding from bar to bar. “But it’s not easy,” Dillon told Leo. He should not feel bad that he couldn’t do the monkey bars. “Yet,” Miss O’Shea added. That was a favorite word of hers. 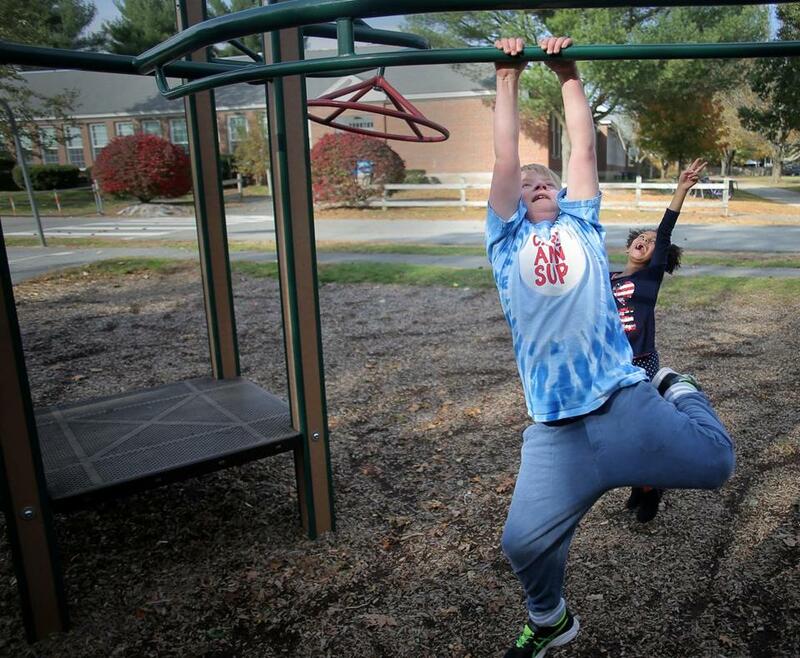 Leo could not do the monkey bars yet. She hurried to the noise, a crowd of students around the monkey bars as Leo reached out with the heels of his sneakers for the far platform. There was shrieking all around him, and at the center O’Shea found Leo, looking as proud as she had ever seen him. That was a few weeks ago. Leo crosses the monkey bars each day now. He has become more confident in class, O’Shea said, and more part of it. At recess now, when Leo and Amelia finish the monkey bars, they move on to their new challenge, which is going sideways. He’s about halfway there. On a recent day, he was on the playground when some first-graders came running up. A few kids went right for the monkey bars and zipped across, but one boy was struggling, so Leo went over. Reach and regrip, he told him.